More new paper, for the girl who said she needed to use up what she has! Hey, at least I cut into it and I'm not hording! So, what's new on this card....Let's see, I've broken away from my signature "black" ink and layers for a new love - Coffee Archival Ink! It coordinates wonderfully with the Pink Paislee papers and Soft Suede card stock. I used some Spun Sugar Distress Ink to dye the Seam Binding, so lovin' this stain and added a few Maya Road Heart Pins I've had in my stash forever! The Little Friends and Friends Touch sentiment are both from Stamoptique. 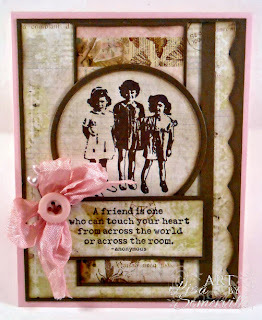 I stamped them in Coffee Archival ink on Pink Paislee papers. The friends image is cut from the center of the panel on my base card, then covered with the added layers following the sketch. For the Scallop Edge, I used Heartfelt Creations Butterfly-Boarder Die, cutting off the loopy edge and covering with a thin strip of Suede card stock. The smaller panel under the stamped image is actually from the cover sheet from the pack of paper (no wasting here). What a lovely card, Lisa! LOVE THIS!! Beautiful girly card. The ribbon, button, and stick pin are the perfect touch! You do Vintage better than anyone I know, this is awesome! This is beautiful, I love the color combo and that ribbon looks gorgeous. Sweet GF card! Luv your colors, the "brown" ink and the ribbon, sa-weet gf, sa-weet. This is gorgeous! Love the pop of pink you added. So glad that you could play along with us this week on Card Patterns! So pretty! Precious image and sentiment and the button on the pink bow is perfect! I love that you stamped in brown, because black can be a little hard at times. Love this card! Look at that bow!!!! 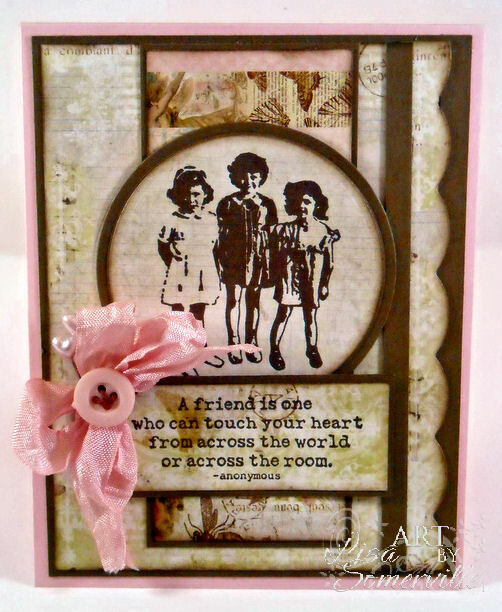 Great card, I love the browns/pinks with this card, so soft and pretty. Great image and sentiment..love the pop of color! Thanks for playing with us at Card Patterns! lovely! the image is just great!